Updated Thursday February 14, 2019 by POB Soccer. 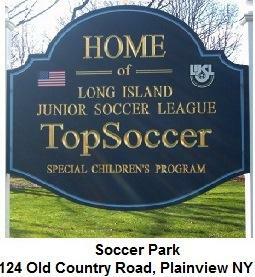 Special Children's Soccer Program of the Long Island Junior Soccer League is for those children with mental and/or physical handicap conditions. This program was initiated to accommodate those children who are not able to participate in a regular or mainstream soccer activity. It provides an opportunity for that child who deviates from the average or normal child in mental, physical or social characteristics to such an extent that he or she requires modified educational practices and services in order to develop to his or her maximum capacity. As such, any child with a severe auditory or visual impairment, orthopedic handicap, behavior deviations or mental retardation would benefit from a special sports program because he or she requires a special learning environment that is directed towards identifying and remediating their physical as well as cognitive deficits. This could include cerebral dysfunctions, impulse disorders, mental retardation, Down's Syndrome, physical handicaps, learning disabilities, Epilepsy, etc. We have a Spring and Fall schedule similar to the regular or mainstream soccer programs. Each seasonal schedule is made up primarily of skills sessions which are run by the individual Club. A couple of tournaments are hosted by a few of the individual Clubs during each season as well. The premise of the skills sessions is to teach the children the game of soccer while at the same time providing them with an environment that is fun and pressure free.